Sunshine. High 78F. Winds SSW at 5 to 10 mph..
A few clouds overnight. Low 51F. Winds S at 5 to 10 mph. Santa Barbara Museum of Natural History Vertebrate Zoology department's Dr. Fahy (left) and Curatorial Assistant Julia Schorr (right) contemplate logistics prior to the packing process. Museum volunteers and staff help Dr. Fahy (center) pack specimen drawers in preparation for the transfer. The freezer unit generously loaned by Container Alliance arrives at the Museum. The 45,000-specimen Vertebrate Zoology collection includes 25,000 avian specimens (including eggs and nests), 11,500 mammal specimens, and 6,000 fish and reptile specimens. Until recently, the vast majority of the avian and mammal specimens were housed in wooden cabinets dating to the 1960s. Though beautiful and well-crafted, the wooden cabinets favored in the past were also prone to infestation by damaging insects, and they created an atmosphere of acidic off-gassing that could degrade specimens. As the science of preservation advanced, curators learned about this danger and started replacing their wood cabinets with more chemically stable metal ones. 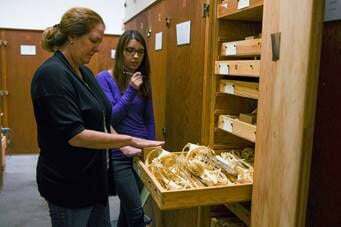 It has been over 20 years since the Vertebrate Zoology Department was able to upgrade the storage for the egg collection, now the rest of the collections are taking another big step forward in preservation. “It’s a big project to completely rehab this historic collection,” said Curator of Vertebrate Zoology, Krista Fahy, Ph.D.
With the support of several generous Museum friends and a $73,000 grant from the California Cultural and Historic Endowment to purchase and install 37 new museum conservation-grade metal cabinets, the critical project is finally underway. Container Alliance donated the use of an 8 by 20-foot long -20° F freezer unit, so that each block of specimens being transferred into new storage can first be frozen to kill any pests that may have hitched a ride from the old cabinets. Vertebrate Zoology staff and dozens of volunteers at the Museum provided the labor of packing and moving the tens of thousands of specimens that are making the transition. The entire process is projected to take about six months. “It’s a milestone for the Museum! In my 24-year career here, there have been great strides made in collection growth and digitization. This project will ensure the conservation of this material for decades to come, allowing the Museum to continue its mission to disseminate information from our collections to citizens and researchers around the world,” noted Dr. Fahy. Once completed, the project will not only secure specimens but will provide additional space for collection growth.